[146 Pages Report] The global Mobile Device Management (MDM) market is expected to grow from USD 2.36 Billion in 2017 to USD 7.86 Billion by 2023, at a Compound Annual Growth Rate (CAGR) of 22.8% during the forecast period. The base year considered for the study is 2017 and the forecast period is 2018–2023. 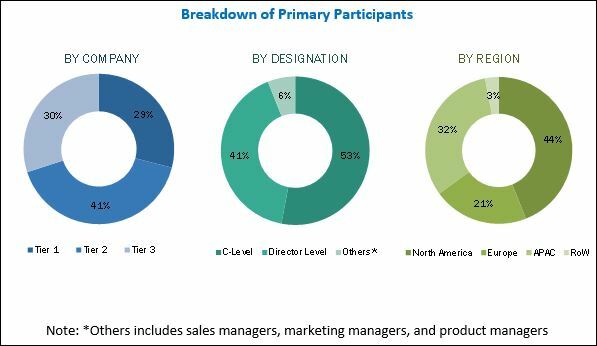 The MDM market report aims at estimating the market size and potential of the Mobile Device Management market across different segments, such as types (solutions and services), deployment types, organization size, industry verticals, and regions. The primary objectives of the report is to provide a detailed analysis of the major factors (drivers, restraints, opportunities, industry-specific challenges, and recent developments) influencing the market’s growth, analyze the market opportunities for the stakeholders, and offer details of the competitive landscape to the market leaders. Key players in the Mobile Device Management market include BlackBerry (Canada), IBM (US), Microsoft (US), MobileIron (US), VMware (US), Citrix Systems (US), ManageEngine (US), SAP (Germany), Sophos (UK), and SOTI (Canada). The key innovators include Mitsogo (US) and 42Gears Mobility Systems (India). 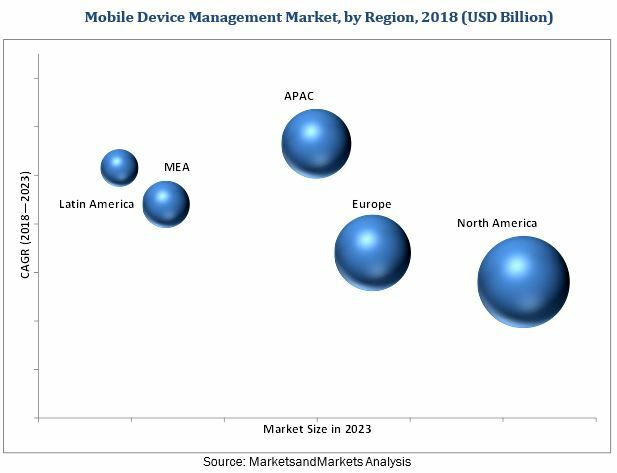 MarketsandMarkets forecasts the Mobile Device Management (MDM) market to grow from USD 2.81 Billion in 2018 to USD 7.86 Billion by 2023, at a Compound Annual Growth Rate (CAGR) of 22.8% during the forecast period. The major factors that are expected to be driving the Mobile Device Management market are the propagation of smartphones and tablets, the increasing productivity of both employees and enterprises, and the growing security concerns to protect corporate data. The objective of the report is to define, describe, and forecast the Mobile Device Management market size based on types (solutions and services), deployment types, organization size, industry verticals, and regions. Among the solutions segment, the security management subsegment is expected to grow at the highest CAGR during the forecast period. The security management solution is used to protect corporate information from cyber-attacks. This solution also helps organizations in formulating stringent security policies for protecting their corporate data from outside threats. The security and privacy of devices and applications have been the top priorities for every business, as mobile devices are more vulnerable to attacks as compared to that of desktops and Personal Computers (PCs). The cloud deployment type is expected to witness a faster growth rate in this market, as it is being rapidly accepted by various enterprises, because of its easy, flexible, affordable, and scalable features. Moreover, cloud-based solutions empower IT teams to enroll, lock, protect, and manage devices from a remote location. Modern mobile device operating systems demand regular updates of their platforms for their smooth functioning. A cloud-based MDM solution offers a faster response to such updates as compared to that of an on-premises solution. Among the industry verticals, healthcare is expected to be one of the fastest growing in the Mobile Device Management market, due to the widespread adoption of mobile devices in this industry vertical. The wide use of mobile devices among patients, doctors, nurses, and other supporting staff has increased across the globe. Therefore, it is expected to drive the adoption of MDM solutions in this industry vertical. MDM plays an important role in the healthcare industry vertical by providing a 360° view of customers and optimizing interactions at every point. North America is expected to hold the largest market size in the Mobile Device Management market during the forecast period, followed by the European region. The region has been receptive toward adopting MDM solutions within organizations to safeguard their content from piracy and data breaches, web and network threat security, cyber-attacks, and severe data losses. The APAC region is expected to experience a strong growth in the coming years, as the organizations are looking forward to adopting enterprise mobility solutions for meeting the demands of a dynamic mobile workforce. Economic growth, young population, cloud-based solutions for Small and Medium-sized Enterprises (SMEs), use of local brand tablets and smartphones for business purposes, and the growing Bring Your Own Device (BYOD) trend are the expected factors to be driving the overall MDM market in this region. The increasing adoption of cloud-based MDM solutions among the SMEs is expected to offer huge opportunities for the growth of the Mobile Device Management market. However, the declining adoption of BYOD among businesses is expected to act as a major restraining factor that could hamper the growth of the MDM market. The major vendors in the MDM market include BlackBerry (Canada), IBM (US), Microsoft (US), MobileIron (US), VMware (US), Citrix Systems (US), ManageEngine (US), SAP (Germany), Sophos (UK), and SOTI (Canada). The key innovators include Mitsogo (US) and 42Gears Mobility Systems (India).